ROCKVILLE, Md.--(BUSINESS WIRE)--Sept. 7, 2004--Federal Realty Investment Trust (NYSE:FRT) announced today that its Board of Trustees has declared a regular quarterly cash dividend of $0.505 per share on its common shares, resulting in an indicated annual rate of $2.02, an increase of $0.06 annually. The dividend will be payable on October 15, 2004, to common shareholders of record as of September 24, 2004. This increase represents the 37th consecutive year that Federal Realty has increased its common dividend and is the largest annual increase by Federal Realty since 2000. "Federal Realty's record of consecutive annual dividend increases is one of the Trust's most valuable assets and a record that we are very proud of," said Donald C. Wood, Federal Realty's President and Chief Executive Officer. "The growth in our annual dividend increase from $0.02 per year in 2003 to $0.06 per year in 2004 reflects the continued strong performance of our portfolio and our assessment that Santana Row has made the transition from Federal Realty's greatest risk to our greatest opportunity." In celebration of this announcement, Federal Realty will ring today's Closing Bell at the New York Stock Exchange. Federal Realty continues to lead the REIT industry in consecutive annual dividend increases. The Trust has increased its common dividend every year since 1967. Federal Realty's dividend increase record is ranked 26th on the "Longest Records of Dividend Achievement" list published in the Summer 2004 issue of Mergent's Dividend Achievers. 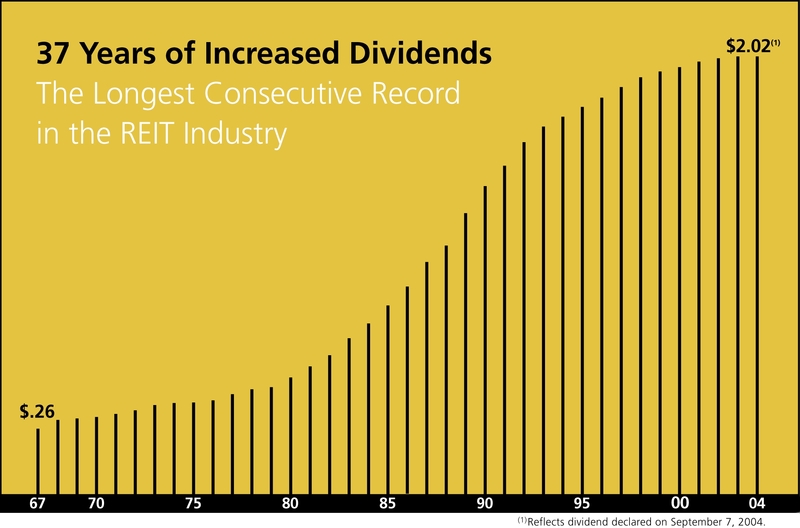 To become a Mergent "Dividend Achiever," a publicly traded company must have increased its dividends for at least the last ten consecutive years. Although more than 10,000 North American-listed, dividend-paying companies are considered each quarter for classification as a Mergent "Dividend Achiever," only 3 percent qualified as of April 30, 2004. Some of the Dividend Achievers boasting increase records longer than Federal Realty's include Procter & Gamble Co., 3M Co, Coca-Cola Co, and Johnson & Johnson. Federal Realty's Board of Trustees also declared a regular quarterly cash dividend of $0.53125 per share on the Trust's Series B Cumulative Redeemable Preferred Shares (NYSE: FRTprB). Dividends on the Series B Cumulative Redeemable Preferred Shares will be payable on October 29, 2004 to shareholders of record on October 15, 2004. Federal Realty Investment Trust is an equity real estate investment trust specializing in the ownership, management, development, and redevelopment of shopping centers and Street Retail properties. Federal Realty's portfolio contains approximately 16.9 million square feet located primarily in strategic metropolitan markets in the Northeast, Mid-Atlantic, and California. The operating portfolio was 94.2% leased to approximately 2,200 national, regional, and local retailers as of June 30, 2004, with no single tenant accounting for more than 2.4% of rental revenue. Federal Realty has paid quarterly dividends to its shareholders continuously since its founding in 1962, and has increased its dividend rate for 37 consecutive years, the longest consecutive record in the REIT industry. Shares of Federal Realty are traded on the NYSE under the symbol FRT.